If you live in the United States, hopefully some congratulations are in order. You’ve filed your taxes and put another stressful season behind you. Maybe you took care of it months ago or perhaps you filed just under the wire. But whether you worked with a professional or took a DIY approach, you probably had a few late nights surrounded by piles of paper and tiny little receipts. It’s like a journal of the previous year as seen through the eyes of a messy paper trail. What is a 1099-G exactly? Was that flight a business trip? Who is Jordan M? And why did I take her to dinner and spend $126.89? What’s more is that every situation is different. Maybe you got married or moved across state lines last year. Perhaps you have a 9-5 with a gig on the side. Or maybe you’re self-employed. Regardless of your circumstances, preparing your tax return is usually a tedious, soul-numbing experience that’s also, for many of us, full of anxiety. But it doesn’t have to be that way. You can take the pain out of tax season by staying organized all year long. With proper planning (and a trusty Evernote account of course), April 15, 2019 won’t exactly be a holiday, but it will be a lot easier. One of the biggest hurdles when it comes to preparing your taxes? Just knowing where everything is. You have to organize all your government forms, fish out your returns from previous years, and hunt down every little piece of paper that could even remotely be related to your finances. Soon enough, you start to feel like a forensic accountant—minus the extensive training. It helps if you have a little structure. The good news is that this is something you can take care of right now. There are lots of different ways you could organize this, depending on your preferences. But here’s one idea: create a finance stack. Stacks are way to group notebooks around a similar theme. That way you can see the big picture all in one place but also easily drill down into the details of a specific issue. For example, you could keep your tax information in context along with your ‘Budget’ and ‘Mortgage info’ notebooks. 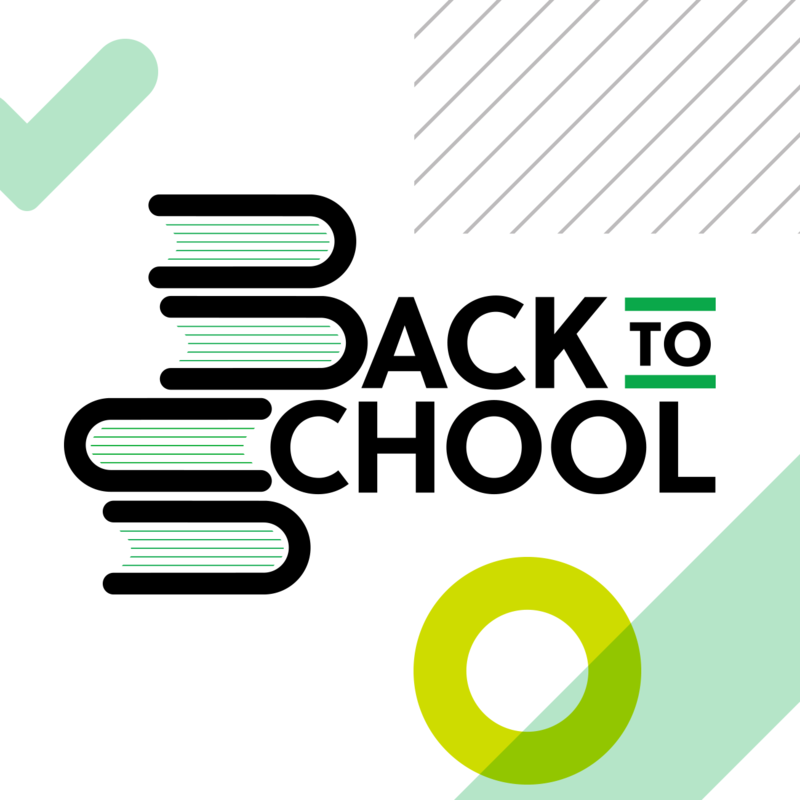 As for setting up your notebooks, you could create a general ‘Taxes’ notebook, or a specific one for each year (‘2018 Taxes’). You may also want to consider setting up a ‘Receipts’ notebook to send all those little scraps and files into one central place, moving them into the appropriate tax year notebook at a later date. When you’ve got your system in place, it’s time to add what you already have. You can attach files to a note so you can easily put tax-specific documents, like PDFs of returns from previous years, in your taxes notebook. Create a note for each thing you want to add, using the tax year and the name of what you’re adding as your note title (such as ‘2017 – Invoices’). Think about other files you could add, such as loan documents, health insurance details, or your banking and savings account information. By creating a structure and adding the files you already have, you’ve done what you can to put yourself on a good footing for tax season next year. Now it’s about changing your organization habits and maintaining the behaviors that will put you across the finish line. One easy area to focus on? These pesky little slips of paper (or assorted digital files). Whether it’s a business cost, a moving expense, or a charitable donation, receipts are something you need to keep track of for the tax man. Thankfully, they are something that can be managed on-the-go, all year round. 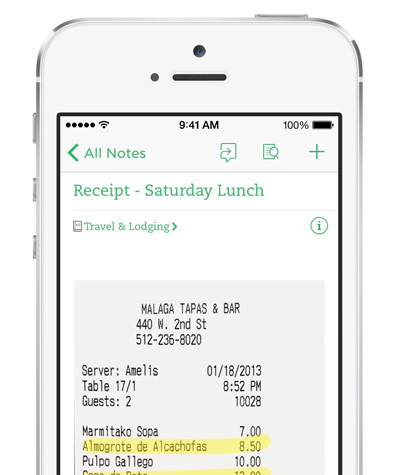 Use the in-app camera in Evernote for Android or iOS to capture any receipt right when you get it while you’re out and about. The best part? Not only do you not have to worry about losing it, you can also search through the text, as Evernote makes text inside images searchable. So if you know that you had some business expenses on that trip to California back in March, you could simply search for “gas Santa Monica March” and quickly pull it up. Another issue with preparing your taxes these days is that you don’t just have physical documents and receipts to keep track of. Your financial information and receipts are scattered to the digital winds, hidden throughout various accounts, web pages, and emails, which makes it hard to hunt it all down. 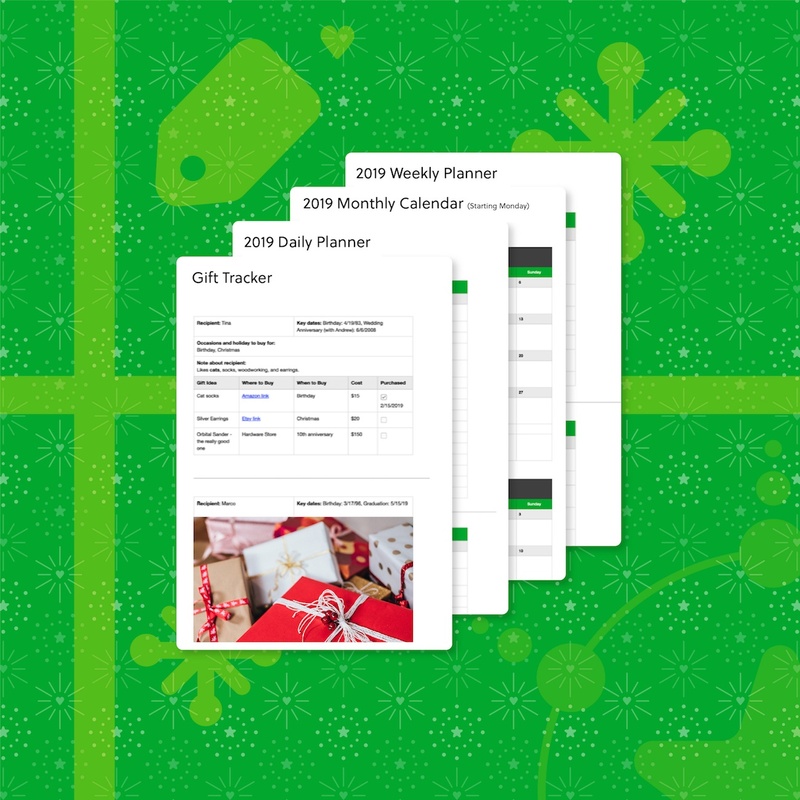 Thankfully, by saving email into Evernote and using Web Clipper, you can send it all straight to your taxes notebook as you encounter them, so it’s all in one place this time next year. 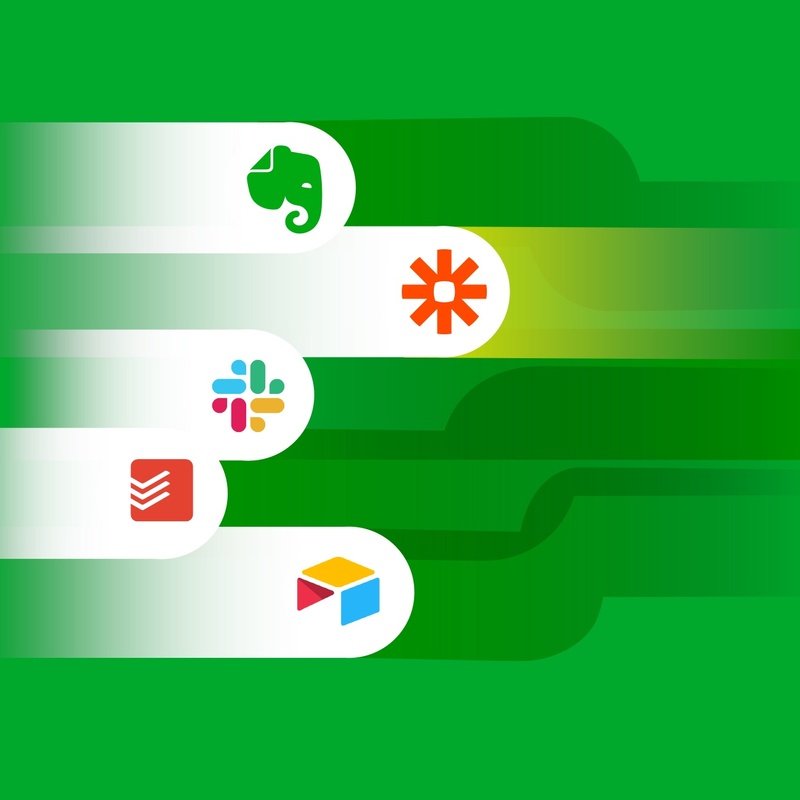 When you get an email that has something to do with your taxes, such as an electronic receipt, bill, or statement, just use your Evernote email address to forward it to your account. Likewise, when you come across a contract, invoice, or payment confirmation when on a web browser, use Web Clipper to save it to your notebook. Chances are other people need to be involved in managing your financial situation. Whether it’s your accountant, your significant other, or your sister the business whiz, you can easily share your tax notebook so you can work together to get it done. When it comes to taxes, getting all your ducks in a row isn’t easy. But with the right structure in place, and about 10 minutes of scanning, filing, and saving each week, you’ll be ready when tax season inevitably rolls around again.